Can you spot Disney’s Mickey on the branch of Mickey Mouse Plant in the left image? Cool, right! 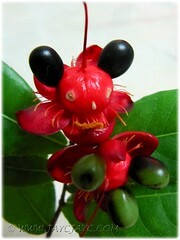 Now you know why one of Ochna kirkii’s common names is Mickey Mouse Plant. Its roundish and glossy black fruits, protruding from the swollen base of the bright red calyx, somewhat resemble Mickey’s ears, especially if only two black berry-like fruits remain while the others have dropped or devoured by birds. Truth be told, I just couldn’t spot Mickey Mouse initially when there were 4 ripe drupelets on the waxy pad. Therefore, I allowed my imagination to run wild and simply plucked 2 of them and magically Mickey appeared before my eyes… hehe! Ochna kirkii has become a very popular garden ornamental due to its attractive flowers and fruits that appear in many peculiar forms at various stages of growth. 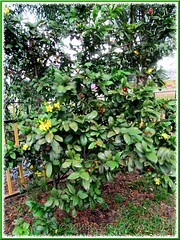 It has a colorful flowering sequence whereby a healthy flowering shrub will display at the same time, clusters of pale green flower buds and bud-like calyxes in peach, tea rose or bright red, bright yellow flowers and vibrant red flower-like calyxes, as well as green immature fruits and ripe black berries. Appended below is our photo collage to document some of their unusual forms to mesmerize you as they did us. 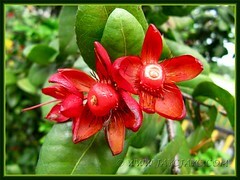 The Mickey Mouse Plant is truly a spectacular and fascinating garden shrub. Keeping our fingers crossed that the black drupelets thrust into our garden plot early this month will germinate successfully. John is doubtful because the berries were not ripened naturally on the bush… anyway, we’ll just wait and see! Etymology: The genus name, Ochna is derived from an ancient Greek word Ochne for Wild Pear alluding to its leaves that resemble those of this pear tree. The species epithet kirkii is named after Sir John Kirk (1832-1922), a British doctor, naturalist and diplomat who accompanied Dr David Livingstone on his second botanical expedition to Central Africa in 1858. Origin: Native to tropical Africa, namely Kenya and Tanzania in the east and Mozambique in the south. Plant type: An ornamental perennial shrub or small tree. 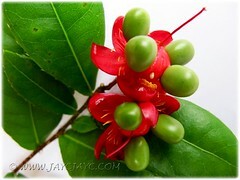 Features: Ochna kirkii is an attractive species among 86 species of evergreen trees and shrubs in the genus Ochna. It’s a slow-growing perennial and evergreen woody shrub that’s somewhat large or small tree that ranges between 1.5-4.5 m in height, with spreading and woody branches covered with lenticels. Its dense foliage is leathery, glossy and dark green, with young leaves emerging light green or have a coppery tinge. The leaves are alternate, oblong-elliptic to narrowly obovate in shape, usually between 5-12 cm long and lined with numerous cilia along the margin. In optimum growing conditions, it can be a year-round flowering and fruiting shrub, It produces bright yellow 5-petaled single flowers in axillary and terminal clusters. 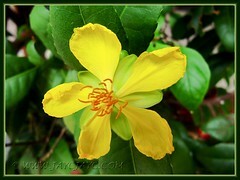 Each flower is 3.8-5.1 cm in diameter, cupped by pale-green or lemon-coloured sepals (calyx) and has a cluster of yellow stamens with orange anthers in the center. However, more spectacular is the colourful flowering and fruiting sequence of the shrub. As the flower petals wither or are shed, the calyx closes up like a flower bud once again and gradually changes in colour to peach and deepen to tea rose. 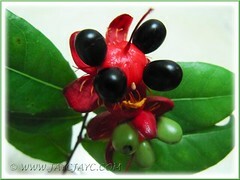 Within it, the fruit that comprised of 1-6 green berry-like drupelets develop on a swollen receptacle. As the berries get bigger, the calyx turns blood red and reopens to expose the immature green drupelets, sitting erect around the long and red style, on the waxy and fleshy red disk and surrounded by the persistent stamens and petal-like sepals. 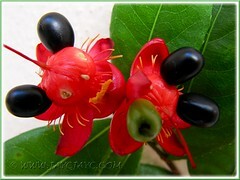 Some of the unripe ovoid drupelets (1.2 cm long) may fall prematurely while others may continue to ripen to become fleshy and glossy black berries, resembling Mickey Mouse face (especially its pair of black ears), hence the plant’s common name, Mickey Mouse Plant. Some species of birds find the ripe fruit palatable. Each ripe drupelet contains a single seed and can be used for propagation. The bright red sepals that are often mistaken as the plant’s flower petals are long-lasting and remain long after the berries are gone. Thus, the Mickey Mouse Plant commands attention! You get to see yellow and ‘red’ flowers, colourful buds, as well as green and black berries, all at the same time adorning its shrub! Fascinating, right? Unfortunately, the ripe black berries are highly attractive to birds too and thus seeds are easily dispersed and naturalized. This plant is now declared as an invasive horticultural plant in Hawaii and probably a noxious weed in other regions of the world. There’s a similar species, Ochna serrulata (Mickey Mouse Bush, Small-leaved Plane), a plant that is declared an environmental weed in Queensland and New South Wales, Australia. In comparison, this species has relatively smaller leaves, 2-6 cm long, and are elongated or narrowly oval in shape, with smaller fragrant flowers, 2-3 cm across, that usually hang downwards. 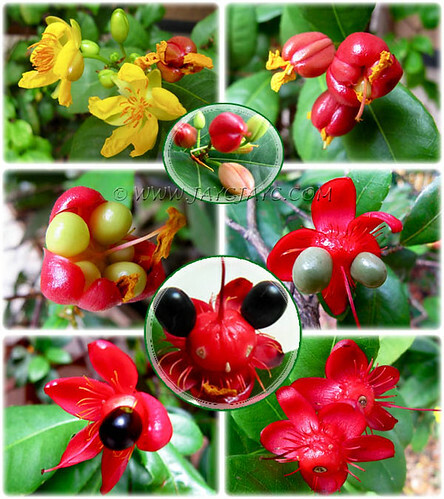 Yet another similar species is Ochna integerrima (Vietnamese Mickey Mouse Plant) that flowers prolifically during ‘Tet‘, the traditional Vietnamese New Year, especially in winter. A deciduous tree that is known to be relatively cold hardy to light freeze with leaves that are wider than the narrow leaves of O. serrulata. 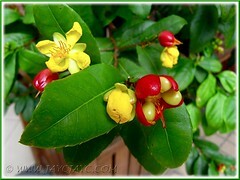 Culture (Care): Ochna kirkii is relatively easy to grow and requires minimum maintenance. Moisture: Medium water requirements. Best to water regularly for optimum growth. Soil: Prefers well drained and fertile soils. 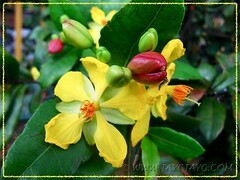 Others: The shrub can be trained to grow into a small tree or pruned to form a hedge. Regular pruning helps to maintain bushiness and encourage flowering. Feed once fortnightly with a balanced fertilizer. Watch out for common pests that include scales, mealybugs and thrips. For subtropical and temperate regions: Hardiness: USDA Zone 9b-11. Winter hardy to 25°F (-3.8°C). Flowers from late spring or early summer. In colder regions, best to plant it in container as patio plant that can be easily overwintered indoors. To propagate, sow seed indoors before last frost. Propagation: By seeds that germinate easily. Usage: Adorned with colourful flowers and unusual fruits, Ochna kirkii or Mickey Mouse Plant will definitely make great specimen plants for gardens, landscapes and parks. An ideal plant as flowering hedges in home gardens, residential and urban areas too. Besides, it is suitable for container gardening, housed in large pots to decorate porches, decks and patios. Grow it if you’re a nature lover to attract birds, butterflies and bees to your garden. MM is indeed a fascinating plant. I am now trying to plant one in a flower pot, the seeds were taken from a plant by the roadside. It grows rather slowly. How amazing to see the colours of yellow, red & black from the same plant. You mentioned propagation by seed. How about stem cutting – would it be successful? @ A.Belle – I’ve read that it is a slow starter but pace increases once it’s well-established. @ James – I think it may be possible to propagate by stem cutting, my friend. I’ve pushed the short branch that was given to me (as seen in the top 2 photos above) into our garden bed about 2 weeks ago and observed that the leaves are still green as ever when I checked on it this morning. Hope it’ll thrive for us. Jacq, you are so astute to have removed 2 berries to reveal the Mickey Mouse. I had been taking shots of the stages too and been looking for MM but failed to see. Now, your naught won over me today! hahaha. I love the way you made that mosaic showing all the stages, wonderful and beautiful too. I came here to ask you something again. Frankly, i haven’t gone to your site to search for it, but I already write here. How do i put the reply portion in my comment box? Is it easy that i can follow, you know me, so ignorant in these computer lingo. Thanks for your sweet thoughts and comments. As per your request, are you asking about Blogger’s latest feature on threaded commenting as seen here. If so, just enable the feature at your blog by going to Settings > Posts and comments, then scroll down to Comment Location and select Embedded and Save Settings. I was indeed enchanted by the scented Tiger Lily or Lilium Lancifolium, when I was up in Cameron Highlands a couple of weeks ago. Can you tell me more on this plant as regards to the propagation and habits. Thank you. So sorry, EKLim… no help from me as I’m not at all familiar with this plant. Now that you’ve mentioned it and I’ve seen its beauty online, I’ll be on the look out for it when I visit C.Highlands, hopefully in August. May I know where was it spotted in CH? Oh, about this “tiger lily”, you can find it in abundance up in CH. I came across them from the local florist in Taiping, and they are not cheap, a stalk of this lily costs RM6.00. When I was up there, I could see them almost everywhere, at the various nurseries and indeed, it was a pleasure just looking at the blooms. They have only the white and the purplish white variety. Enjoy them when you are up in CH. Noted and thank you, EKLim! Have a lovely day. Jackie, sorry I have given you the wrong name, this “tiger lily” that I wrote about is called “star gazer” and the botanical name is simply “lilium orientalis”. Anyway both the varieties are quite similar in appearance. I am tempted to try scraping seagull poop and scattering on the top?